donk | Why you drive bad?! 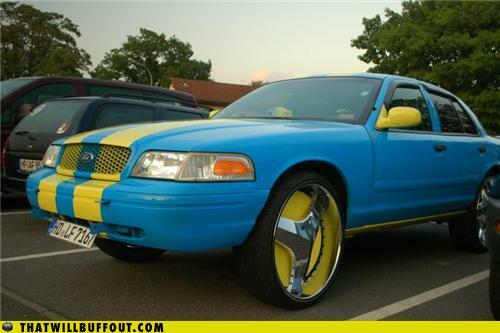 So I came across this picture of a donk (a car that is lifted with giant wheels that probably cost more than the car itself) and thought to myself “Nothing special, it’s just another Crown Vic with a terrible paint job and big wheels.” Then I saw the European license plate on this car and the wagon in the background. That’s when I shat bricks. This abominable and obnoxious trend has invaded Europe. Besides the tacky paint scheme, giant wheels are stressful on the suspension, brakes, and drivetrain. Hopefully the car’s current owner will be the last and that’s how I feel about most of the donks I see on the road. Good luck with this crazy fad, Europe!